Frederick E. “Ted” Hood — a legend in the America’s Cup, sailing, boatbuilding and design — died Friday at the age of 86. Praise and condolences has flooded online sailing and boating forums. “R.I.P. Ted. 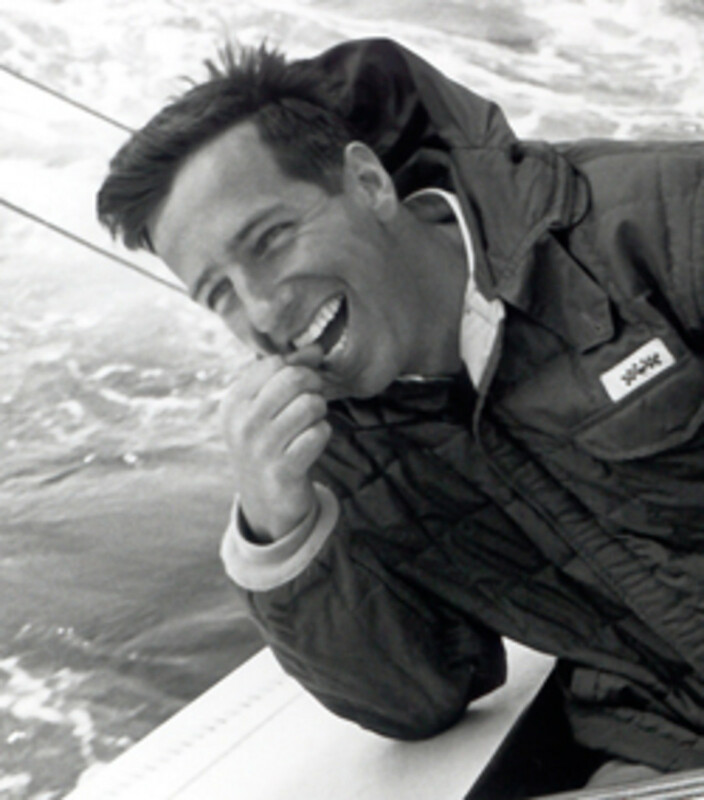 A true asset to the sailing community is gone,” reads a post on Sailing Anarchy. “A truly iconic figure has left us … fair winds,” reads a post on Sailing Scuttlebutt. “He was quite a man, taking over all aspect of yacht design, from the bottom of the hull to the top of the mast. He was himself a great sailor, a legend,” reads a post on BoatDesign.net. For nearly 20 years, Hood was a dominant force in sailing as a sailmaker, naval architect and yachtsman. At 33, Ted Hood is one of the top half-dozen sailors in the country. He is one of the two or three top sailmakers. Recently he began designing sailing hulls — with immediate success. If Roger Maris manufactured the bats he used, sold them to all the very best players and successfully managed the Giants, he would hold a comparable position in baseball. Click here for a 2006 Soundings feature on Hood. Hood founded Hood Sailmakers in Marblehead, Mass., in 1955 and was the first sailmaker to weave his own sailcloth, revolutionizing the process to enhance the strength and durability of his sails, according to a remembrance on TedHood.com. Later, Hood Yacht Systems was an innovator of spars and hardware, such as the "C-Stay" that eliminated jib hanks in headsails, the Gemini grooved headstay for racing, and the Seafurl and Stoway Mast roller reefing systems, according to the remembrance. By the 1970s, Hood Sailmakers had grown into a worldwide network of service and production lofts, with Hood sails used on all of the America’s Cup winners from 1958 to 1977. Hood’s yacht designs included race winners and stable, seakindly cruising boats. His many race victories include the Mallory Cup (1956), Marblehead-Halifax Race (1961, 1971), Newport-Bermuda Race (1968) and the SORC (1974). Also in 1974, as skipper of the Sparkman & Stephens-designed Courageous, he won the America&apos;s Cup beating Australia&apos;s Southern Cross, 4-0. He founded Little Harbor Marine, which during the 1990s grew to be one of the largest yacht service facilities in the Northeast and built Little Harbor Whisperjet boats. Little Harbor also included design and brokerage divisions. After selling his business in 1999, Hood continued to work on new designs as Ted Hood Yachts — powerboats, sailboats and expedition yachts. The Coastal Explorer 52, for example, was reviewed by Power & Motoryacht magazine in the June 2009 issue. Hood designed dozens of boats. He was inducted into the America&apos;s Cup Hall of Fame in 1993 and the National Sailing Hall of Fame in 2011. Hood was known as a man of few words, so fans embraced his 2006 autobiography, “Ted Hood Through Hand and Eye,” which he co-wrote with author Michael Levitt. Hood is survived by his wife of 58 years, Susan Blake Hood; his four children and their spouses; and eight grandchildren. A private burial is planned, with a celebration of Hood’s life to be held in Newport, R.I., later this summer.